Last week I tried out a keyboard and iPad combo for writing and was pleasantly surprised at how well the Bluetooth keyboard I purchased worked. However, if I'm taking my writing seriously (which I am), then I should invest in high-quality tools to help me work. Specifically, this meant replacing my dead laptop. At first, I was allured by the low price of Chromebooks. Sure they don't have a ton of disk space or computing power, but how much of that does one really need for writing? I made a list of all the things I need a computer to do and the software I would like to use. I quickly realized I needed something with more power and flexibility than the current range of Chromebooks has to offer. Ultimately, I treated my laptop purchase as an investment in my writing career. My MacBook Air was already six years old before its accident and it probably would have kept going for a while longer. I have full hopes that my new HP will last just as long. While rattling off all the things I needed in a computer to the sales associate at Best Buy, it got me thinking about all the tools I use as a writer. 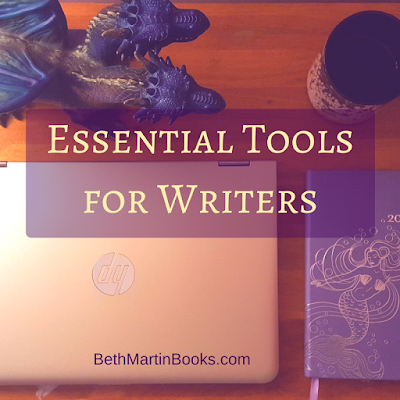 I thought I'd go ahead and share with you all what I believe are the essential tools for an indie author. Computers are the central tools for writing. It's where our manuscripts go and work is done. Technically, all the other essentials could go on your writing computer. Except for the last one. You'll see why. I loved my tiny little laptop for the NaNo write-ins I attended. The only way I can expect to get writing done while out of the house is to make sure I take something to write on with me. Some writers like to draft with journals and pencil and it's easy to keep these items in their bag and take them everywhere. Similarly, some writers use their phones or tablets to write on, items they already keep with them all the time. Or, they stick a laptop in their backpack before heading out the door. I know some people are adamant about creating a specific writing space and routine, but I've never met any of those writers. Probably because they're hiding at home and not acting out scenes for their new novel at the library. Wait, I'm not the only one that does that, right? I don't know why I didn't think of this myself, but Bublish got me in the habit of keeping track of all my writing activities in a calendar. Originally I had it on my computer, but I found it easier to use a planner. I'm able to color code days and add lots of notes. I've got tentative dates for future releases and promotional activities in there. I put in writing related social media stuff so I know I'm posting regularly. I also keep a list of goals and ideas in my calendar. I give each of my goals a time frame to ensure I make consistent progress. Each month has its own list of goals and activities I'll work on. This is a big drawback of using a Chromebook: no Scrivener. I would say any word processor would work for writing, but Scrivener is so much more with a ton of features which helps when writing something long form. It makes it incredibly easy to keep track of scenes and chapters along with characters, research, and notes all in one file. My favorite feature is composition mode. Just a blank screen and text-- no rulers or tools or menus to be seen. And once I've finished a manuscript, Scrivener will export it into a variety of formats including PDF, ePub, and even Word. I have a love-hate relationship with Microsoft Word, but it does all the formatting that I need when getting a novel print ready. I get pretty particular in what I want my finished book to look like, and Word gives me the control to do that. I actually use a few programs for creating images, and each has their own strengths. Canva is a basic one which is great for simple projects like a single image with some text. I use Canva for all of my social media graphics and sketches for future book covers. So far, I've made my own covers as well, and these I've done in Photoshop. Even though I'm not doing detailed photo manipulation (yet), I am able to get everything perfectly centered and laid out, easily enhance the images I've picked out, and add textures and vignettes with ease. It also has text effects like drop shadows which seem to be prevalent in my genre. On the recommendation of a writer friend, I started using Grammarly. I haven't yet tried the advanced version, but the basic one has already proved incredibly helpful. It catches many more errors than any of my other programs (ehem Word) and also alleviates the step of copying and pasting from one program to another when writing things like my blog or emails. Every writer needs fuel, and coffee is the best. As I said early, this tool will not mix well with the computer. Take it from me. Those are my essential tools as a writer. Are there any tools you use that I didn't mention? If you haven't already, make sure to enter my Goodreads giveaway to win a free copy of my debut novel, The End of Refuge.